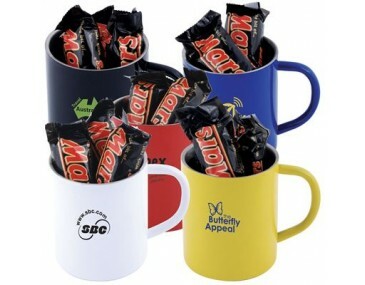 Looking a your mug at the desk and find it plain old and boring? Getting it laser engraved or have it printed with artwork or your logo to make it stand out. Though to some people this isn't enough to attract their attention, so we now have a range of mugs that now have Mini Mars Bars in them. 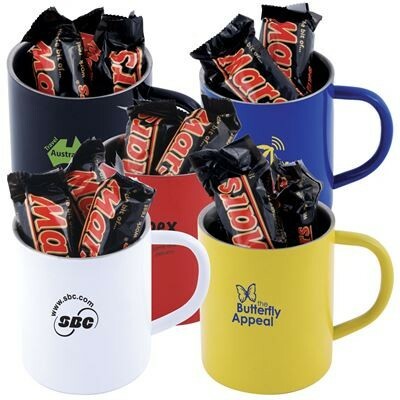 This will get those with a sweet tooth or some curiosity as to where you have placed this in which they will be drawn towards your branded mug. These double walled stainless steel mugs come in Black, Blue, Red, White and Yellow on the outside and silver metal finish on the inside. The dimensions of the mug are: 95mm in diameter and 90mm high. Accurate branding of your logo artwork to your liking is what we want to achieve. Making this happening is easy, please supply your logos for branding in an EPS or PDF format saved with outlines. Unfortunately jpeg's cannot be accepted. We can however organise for your logo to be redrawn for a small fee. Simply email us your logo and we would be glad to provide you with a quote. Our price listed for this mug includes a 1 colour 1 position print. You are not limited to only printing and we have other options for you to explore. Other options include double sided printing, additional print colours or laser engravings. A laser engraved branding result is extremely appealing and is definitley worth exploring. When we do engrave this mug, the top layer of colour gets removed to reveal a silver background. A print set up cost of $80 does apply for branding and prices do exclude Australian GST. Please contact us by phone or follow the prompts on this web page to obtain a quote. PACKAGING 27 per carton = 7.5 kilos. CARTON SIZE(CM) 31.5 x 29.5 x 20 cm.